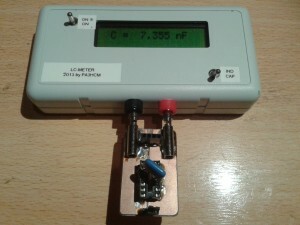 The LC meter adapter in action. The dutch electronics shop Van Dijken Elektronica sells a nice kit to build your own LC meter. The kit includes a professional PCB, all components, building instructions, prepared case and leads. 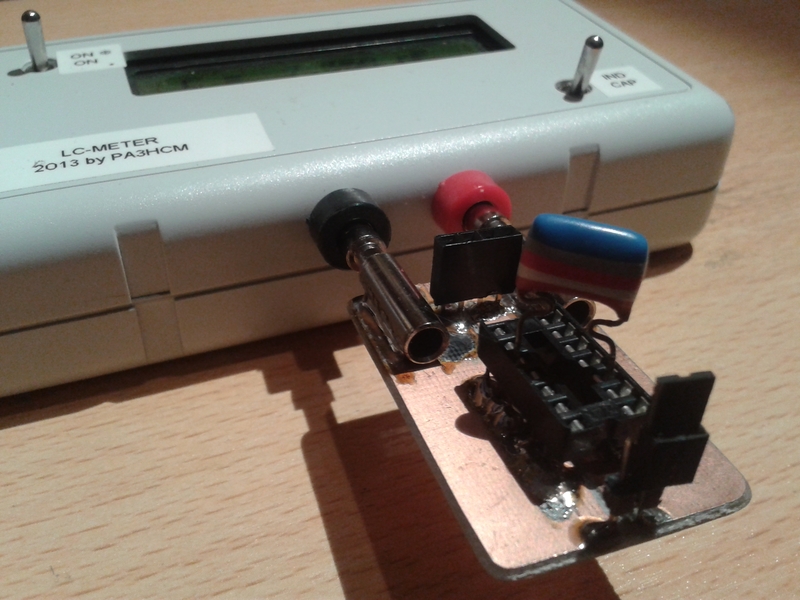 The kit takes an evening to assemble, the result is an instrument to measure capacitors and inductors. Every radio amateur should have one. I bought and built this kit about two years ago and used it with almost any homebrew project. But every time I had some trouble with the leads. Moving them results in a different distance between the leads and influences the measurement. Tonight I decided to get rid of the leads and build a simple adapter. It took me an hour to build, and another 30 minutes to write this article. The adapter is made of copper clad. I cut the copper in the middle and soldered a 4mm connector on each side of the gutter. 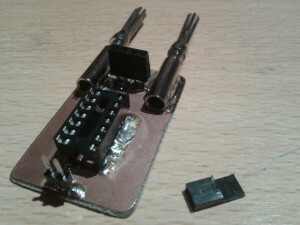 I soldered an IC socket and a 2-pin jumper, both above the gutter. The jumper makes it easy to shorten the adapter (required for callibration when measuring inductances). Just look at the pictures down here and I’m sure you can build your own adapter. 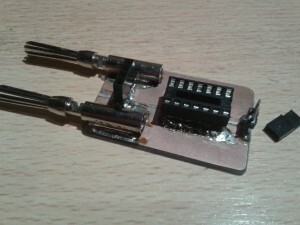 Just modify the connectors (probably just the spacing) to use the same idea on any other LC meter. Connect the adapter to the LC meter. Be sure no components are placed on the adapter. Power on the LC meter in L mode. Remove the jumper when the ‘Callibrating’ message disappears. Place the inductor in the IC socket and read its value from the display. Measuring a capacitor is about the same, except that the jumper needs to be removed before powering the LC meter. 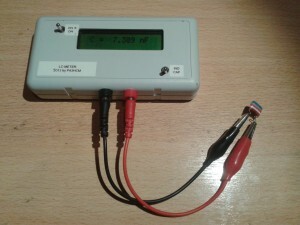 The LC meter with the original leads. The same LC meter, now with my adapter. LC meter adapter, front view. LC meter adapter, side view.